Cynthia Petrovic is an artist and illustrator who has worked as a story-board artist at places like Warner Brothers Television Animation. 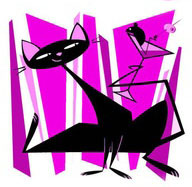 Branching out on her own, she created a line of artwork and other products called Red Tango, based around her fascination for critters — especially rather slim and stylized felines. She has a very animated interactive web page that includes not only her current products but also samples of her story-board work.